When dealing with live CCTV surveillance emergencies and critical investigations, time is critical. However, even with today’s “advanced” remote CCTV monitoring technologies, the threat level of an incident could be incorrectly qualified or missed completely. This is because of CCTV surveillance operator availability, fatigue or infrastructure downtimes. This weakness in an organisation’s security enterprise could lead to catastrophic consequences. Operating completely independently of the command control, Viseum UK’s CCTV surveillance provides full visibility and control of the entire area under protection, and it does not need to rely on any CCTV surveillance infrastructure in order to proactively detect and capture incidents. This automated intelligent CCTV, operating with advanced remote CCTV monitoring technologies results in the best of both worlds, where intelligent CCTV surveillance automation interplays with human vigilance. This new partnership optimises the key human element of security by not depending on human intervention to detect and capture evidence of crime, and index its evidence. This means that operators have more time to react in making key decisions for responding. Not only is the Viseum PTZ Camera trained to point itself at, and zoom into and follow events of interest, but Viseum UK’s contextual view camera recordings are also valuable during live incidents or post-investigations. Images from these surveillance cameras matched with the PTZ camera’s close-up recordings, show what else is happening in the whole area and who else is witnessing the event. As well as the PTZ Camera’s surveillance images typically being recorded centrally, images from the PTZ camera and all Viseum’s fixed contextual view cameras are also stored locally and of greater quality, than can be transmitted over a typical wireless network. This makes them invaluable for primary evidential use or for distributed backup storage, and provides resilience against loss of evidence by removing any single point of failure. Digital Integration of the Viseum CCTV surveillance eliminates the need for operators to receive any specific training in the basic use of Viseum cameras and local NVR/DVR. 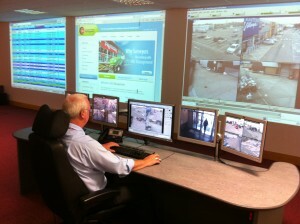 It delivers a higher level of surveillance service with fewer operators, and images from the moving PTZ Camera and all or any one of the wide-contextual camera views, can be displayed on the surveillance central control room video wall and/or spot monitors only when relevant activity occurs at the camera installation. The most advanced CCTV surveillance camera in the world working hand-in-hand with leading remote monitoring services produces the fastest and most accurate complete end-to-end security service available. Viseum’s intelligent Panoramic Security Camera provides constantly vigilant CCTV surveillance for the remote protected site 24/7/365. It can uniquely produce close-up video of the event at the same time as the initial alert is reported to the remote monitoring service. This means that the incident can be reported in sufficient detail for it to be dealt with in the most rapid and efficient way possible. Once the breach is confirmed and the alarm is raised by the remote monitoring service, the relevant local authorities may not only be given information that somebody has entered the area, but can also be shown a detailed description of the suspect committing the theft and/or criminal damage, and where they are now, where else they have been on the site, and everything they have been doing. If the suspect is apprehended at the site during the incident they can be presented with such detailed information as their particular clothing and any noticeable brand logos. Even if they are wearing a hood or any type of facial mask, this level of detailed evidence is proven to persuade the suspect to own up to the offence. Likewise, if the suspect escapes, this detailed video evidence is proven to help local authorities recognise and even identify the suspect.